Calor Gas 47kg Propane gas bottles are most often used for home energy supply. They are also the perfect solution for outdoor and light commercial use. When buying a Calor Gas bottle for the first time, you’ll be subject to a new cylinder refill agreement. Please have any empty gas bottles available for exchange if applicable. Any order without a suitable gas bottle to exchange is subject to a cylinder hire charge. 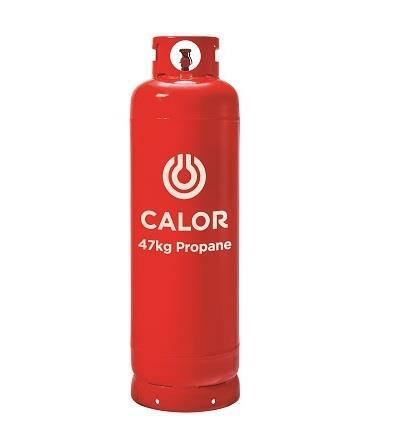 The delivery of Calor Gas is subject to a delivery charge of £3 and is only available to local delivery postcodes. Local delivery days are Monday, Wednesday and Friday. Please ensure your order is placed the day before. If you have a Calor Gas cylinder to exchange please select Gas below. If you haven't got a Calor Gas cylinder to exchange please select Gas & Cylinder Hire below.